A Case of the Runs: More Larabars! Tea Time and I reviewed Larabars a while back here. It seems that there are some new flavors that we missed. These "Jocalat" varieties are still vegan and raw (crushed dates and such) yet tasty. I've tried these at expos, and Tea Time brought a box home as well. - Chocolate: Very mild chocolate flavor. Not bad. - Chocolate Mint: I am not a big fan of this flavor combination, but it was acceptable because of the subtlety. - Chocolate Orange: Again, not too bad because the chocolate is not overpowering. However, I don't like orange-flavored things, so this would rank low for me. - Chocolate Coffee: Quite good... maybe because I am a mocha fan. The coffee taste definitely adds to this. - Chocolate Cherry (not pictured): Slightly tart with the chocolate flavor to off-balance it. 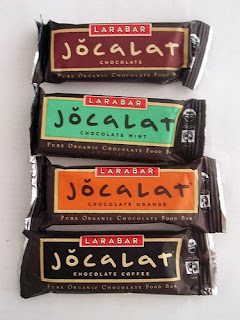 - Peanut Butter Cookie (not pictured): This isn't a "Jocalat" bar (though PB & chocolate?? mmm! ), but this is my new favorite Larabar. It really does taste like a peanut butter cookie... so soft, not too nutty, and less sinful.